A new study led by researchers at the National Cancer Institute (NCI), part of the National Institutes of Health (NIH) has uncovered an unforeseen process in the acquisition of drug resistance by cancer cells that bypasses the need to re-establish DNA damage repair in breast cancers that have mutant BRCA1 or BRCA2 genes. The results of the study—“Replication fork stability confers chemoresistance in BRCA-deficient cells”—were released today in Nature. Within healthy cells, the proteins BRCA1 and BRCA2 act as DNA damage sensors, surveyors, and responders, while also performing complex functions that facilitate the repair of damaged DNA. 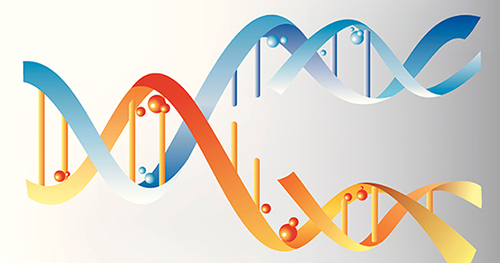 Individuals who inherit certain mutations in either the BRCA1 or BRCA2 gene have defective DNA repair and an increased risk of developing breast, ovarian, and other cancers. Specifically, mutations in BRCA1 and BRCA2 account for 20 to 25 percent of hereditary breast cancers and between 5 to 10 percent of all breast cancers. The reduced ability to repair breaks in DNA in cells with a BRCA1 or BRCA2 mutation makes the cells sensitive to DNA damaging drugs. Unfortunately, however, many breast cancers eventually acquire resistance to these drugs. One documented mechanism for developing chemoresistance in such tumors is through the restoration of accurate DNA repair pathways that mend DNA breaks caused by chemotherapy. “It is the intricate mechanisms that tumor cells evolve to bypass the need for accurate DNA repair that forms the foundation of our study,” explained Andre Nussenzweig, Ph.D., chief of the Laboratory of Genome Integrity at NCI. “A deeper knowledge of the processes that drive drug resistance in mutant tumors will lead to novel therapeutic approaches that target tumor-specific vulnerabilities.” Nussenzweig's laboratory has spent the past decade trying to understand the cellular mechanisms that regulate DNA repair in normal and pathogenic states. In the current study, the research team was able to link the protection and stabilization of DNA replication forks as a major contributory mechanism to drug resistance in BRCA1/2-mutant breast and ovarian cancers. The movement of a replication fork as it migrates along a DNA molecule can be disrupted by the presence of a diverse group of DNA structures and proteins, collectively and loosely referred to as replication fork barriers. Interrupting for migration often results in a replication stall, which signals the entrance of the BRCA1 and BRCA2 proteins to protect the newly synthesized strands of DNA. If these proteins are absent, the replication fork is destabilized, and the newly synthesized DNA is degraded, which increases genomic instability and increases sensitivity to DNA-damaging drugs. Nussenzweig and his colleagues were able to identify other proteins, such as PTIP, CHD4, and PARP1, which actively promote replication fork destabilization through the recruitment of enzymes that degrade newly synthesized DNA. The absence of these proteins protected the DNA at replication forks and remarkably reversed the drug sensitivity of both BRCA1- and BRCA2-mutant cells, making them chemoresistant. These results are of particular relevance in the clinical setting, where expression of these proteins appears to be an indicator of how patients with BRCA1- and BRCA2-mutant cancers will respond to chemotherapeutic treatment with DNA-damaging agents. Moreover, the findings underscore the importance of replication fork barriers to genomic instability and drug sensitivity in the context of BRCA1/2 mutations—suggesting that the cellular levels of these proteins could be used as a prognostic factor in acquired resistance in BRCA1/2-mutant cancers. “Our work is starting to not only refine, but also redefine, the current dogma in the field, which states that restoring DNA repair pathways are the only means by which BRCA1/2-mutant cells can become chemoresistant,” Nussenzweig concluded.